Positively Feed Pump-A thick stock pump will easily pump up to 20% consistency if properly feed, The application of dilution water is required on existing screw pumps, due to inadequate feed conditions. Reduce the Bulk Volume- A screw pump is a positive displacement pump. When we reduce the bulk volume by compressing excess air out of the stock, the pump becomes more efficient and turns at a slower speed. This is due to transferring more stock and water, and less air. This reduction in speed improves equipment reliability. Reduce the Pipeline Pulsation- Reducing the amount of air in the discharge line will dramatically reduce pipeline pulsation. This reduction in pulsation improves system and equipment reliability. Adding dilution water to reduce pulsation is not required. 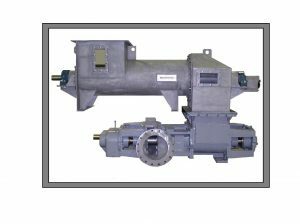 A screw pump must first receive the stock suspension in order to discharge the suspension. A screw pump must be fed uniformly to discharge uniformly. In designing the feed system, the relationship between network strength, stock density, frictional head losses in the chute, inlet chute height & Straightness, and pump speed must be considered. As consistency elevates the density of the stock decreases and the network strength and wall friction increase. Bridging is the result of the combination of phenomenon that occur when elevating consistency, increasing tonnage, or dealing with inadequate inlet conditions. A fiber network or bridge takes place in the drop chute directly above the live bottom feed screws. This bridge of fibers will partially or completely block the passageway that leads to the pumping screws. The stock in the drop chute will accumulate until the chute and repulper trough are full. Dilution water will be required to break up the bridge. The Schurco VRHC Feeder in conjunction with Schurco Engineering will eliminate dilution water in your system. Call us today to speak with an engineer on how to improve your system.